Will a Humidifier Help To Stop Snoring? Dealing with a snoring problem is never easy. In order to cure a snoring problem, the first step is to identify exactly what is causing your snoring. Identifying the cause of snoring can often require a bit of trial and error. You may have heard that a humidifier can help to ease a snoring problem, which can be true. In low humidity conditions, the nasal passages can become dry, irritated, and inflamed which can restrict the flow of air and may contribute to snoring. Increasing humidity levels by running a humidifier can help to create an environment that soothes your nasal passages and prevents snoring. If you suspect that low humidity is the cause of your snoring, you should first measure humidity levels using a hygrometer to determine exactly where the humidity levels fall within your home. If the humidity in your home is lower than acceptable, adding humidity to the air will make breathing more comfortable and may even cure your snoring problem. What exactly is an acceptable level of humidity? In general, the lower the outdoor temperature, the lower the humidity should be indoors. When outdoor temperatures exceed 50˚ F, humidity levels shouldn’t exceed 50%. With outdoor temperatures between 20 ˚ F – 49˚ F, humidity should remain around 40 %. As temperatures drop, lower humidity levels become acceptable. Before increasing the humidity levels in your home, keep in mind that mold thrives in humidity conditions that are greater than 60%. Because of this, you should constantly monitor the humidity levels in your home and choose a humidifier that uses a humidistat which cycles the humidifier on and off based on humidity levels. By allowing humidity levels to exceed 60%, you can create unhealthy conditions which may cause more harm than good. How To Choose A Humidifier for Snoring? If after you measure the humidity levels in your home you determine you could benefit from a little extra moisture in the air, you can purchase a humidifier which will add water vapor to the air. Before deciding which type of system to go with, you will have a bit of research to do. First, you may want to consider whether to go with a portable unit or a whole house unit that’s installed within your HVAC air delivery system. Portable units are generally less expensive and can be set up in just a few minutes. You simply unpack it, add water and plug it into an outlet. These units have the limitation of only being able to service a room or two. As an alternative, you can have a whole-house humidifier installed in your HVAC duct system which receives a water supply from your plumbing that wets a honeycomb-like filter. As air blows past the filter, water molecules are captured and delivered throughout the home. As you may have guessed, whole-house furnace humidifiers can be more costly in comparison to a portable unit. There are several different whole-house brands to choose from but Aprilaire is one of the more popular manufacturers. Such a unit can be purchased for around $200 plus the cost of installation. Since you are only trying to determine if low humidity is contributing to your snoring, a portable unit should get the job done. If you find that the addition of moisture in the air is helping with your snoring, you can always upgrade to a whole-house humidifier. Focusing on portable units, there are three basic types of humidifiers – warm mist, cool mist, and ultrasonic. As the name implies, warm mist humidifiers release warm steam into the air which is visible. This type of humidifier releases a little bit of heat which can help to make the room a slight bit warmer than the rest of the house. 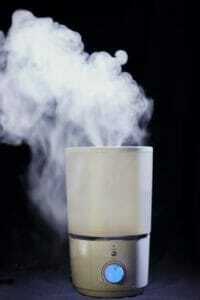 Cool mist humidifiers release water vapor into the air that is cool as opposed to warm. While steam is not visible, moisture is still added to the air. Cool mist humidifiers typically use filters to remove contaminants from the air. Cool mist humidifiers generally operate more quietly in comparison to warm mist humidifiers. The third type of humidifier, ultrasonic, contains a diaphragm which vibrates and creates little water droplets which are released into the air using forced air. These also operate very quietly in comparison to the warm mist humidifiers. In addition to choosing the type of humidifier, there are also several other considerations that you should keep in mind. Next, decide if you would like a unit that contains a humidistat. As mentioned, a humidistat monitors humidity levels and will cycle your humidifier on and off in order to maintain a certain level of humidity. Since constantly monitoring humidity and turning a humidifier off and back on can be a time-consuming task, I would highly recommend choosing a humidifier that contains a humidistat. Another consideration that’s overlooked is ease of cleaning and maintenance. All humidifiers must be cleaned and maintained on a regular schedule. Failure to do so can allow it to harbor harmful bacteria and germs. Consider a humidifier that is easy to take apart and access all of the areas that need to be cleaned. In general, the fewer parts to clean, the better. Unless you use distilled water, your humidifier will build up a white powder over time. This white powder is actually a mineral residue that’s typically in your water. Once the liquid evaporates, a chalky white mineral residue remains. These mineral deposits will need to be removed. Cost is a consideration that you will also want to weigh. 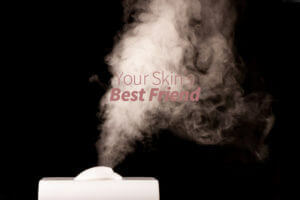 Warm and cool steam humidifiers are generally less expensive in comparison to the ultrasonic humidifiers. The cost will also vary from one manufacturer to another. Finally, consider whether or not a timer is important to you. If you would like your humidifier to only run at night while you are asleep, this is a feature that you may want to consider. Students at the University of Texas at El Paso researched the benefits of having a humidifier installed in your home and found that there are several health benefits besides preventing and stopping snoring which include lower heating costs, smoother skin, and the filtration of toxins in the air. Perhaps you have checked your humidity levels and found them to be adequate. Maybe you have tried using a humidifier and found that it did not do anything to help your snoring problem. The truth is, while lack of humidity can sometimes cause snoring, there are other underlying issues that are far more common contributors to snoring. The single most common problem is lack of tone in the muscles surrounding the throat. As we age, the muscles around the airway become weak and lose tone. This is especially true in those who are carrying a few extra pounds of weight. A loose airway easily collapses and restricts the airway while you are asleep. While breathing, air moves past this restricted area and causes the airway tissue to flap around. This is what typically generates the sound of snoring. So what’s the solution? How do you tighten the muscles in the airway? While there are a few exercises that you can do such as playing the Didgeridoo, there are more practical and less expensive ways to tighten the airway and prevent snoring. The device that I am talking about here is called a snoring mouthpiece and millions of people have found success using one. A snoring mouthpiece, in essence, is a mandibular advancement device (MAD) which resembles an athletic mouth guard and is inserted into the mouth prior to going to bed. The mouthpiece actually holds the jaw forward which tightens the airway and prevents the vibration of airway tissues. In the past, MADs were only prescribed by doctors and cost well over $1,000. Today they are available to nearly anyone and can be acquired for less than $100. You can find more information on all of the available snoring mouthpieces here. My Husband Snores – What Can I Do To Make Him Stop? Laser-Assisted Uvulopalatoplasty to Stop Snoring – What is it and Does it Stop Your Snoring? Previous post: Will A Snoring Mouthpiece Work For Me?